Some adore them, some hate them. Fortunately, there have been several zorro players who amazed all of us in a very special way. They were not just polishing their ego, they were deciding matches. Here are our five best wizards in floorball history. To Helsingborg Daniel Johnson has always been an important striker. Apart of his sweeper shots (perhaps one of the fastest in the Swedish Superligan) Johnsson is mastering his zorro skills in an enormous speed. His ability to run while twisting the ball in the air seems to contradict all natural laws. Formally a great football talent Frejd found his happiness in the Swiss NLA, where he rages with incredible zorro skills. Last season with Köniz he won the Cup and reached the Superfinal. In 2014, when Frejd was playing for Rychenberg, he scored 9 points (5+4) on one weekend, 5 of it via zorro moves. Something about ten years ago Nede was posing on the cover of the Innebandymagazinet. He was the shooting star of the Swedish Superligan, one of its top scorers and an amazing zorro player. Some of his wicked shots, such as a fast strike from the left rink side against Jönköping or a trick from behind the goal against AIK, are until today considered the highest of zorro magic. For a whole decade Peter Runnestig was a key player at Pixbo Wallenstam. Besides greats such as Jihde, Hellgard or Quist the club ruled the international competition and Runnestig was responsible for many insane trick goals. In 2012 he moved to rival Warberg against whom he scored perhaps the most fantastic zorro goal of his career one year earlier (video at 2:01). We don’t know if Janne Tähkä could keep up with the speed of today’s floorball. And you know what? We don’t care. Janne Tähkä is the godfather of zorro. Actually, in some countries people didn’t call the trick a “Zorro move” or an “Airhook”, they called it a “Tähkä”. The Fin was the only zorro player who became an indispensable member of his national team. His looks, his ways and his goals will always be remembered. Snelligen was a solid scorer for the Norwegian club of Sagene. However, he was far from becoming a world class player. His Zorro skills were amazing though. They made him an important member of the Norwegian national team for two World Championships (6 goals in 11 matches). Often Snellingen was only activated to take a penalty. And he never missed. 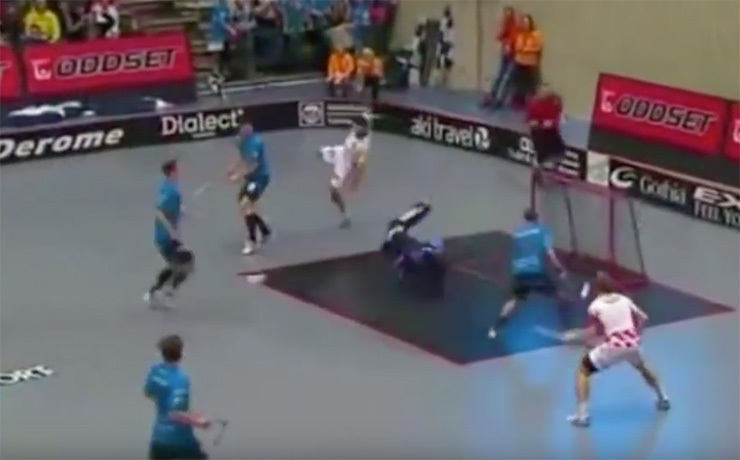 Was This The Best Zorro Goal In Floorball History? Golden Goal schickt Bonn in die Königsklasse! Leipzig ist Deutscher Meister 2019! Frische Artikel und heiße Deals direkt aus unserem Newsroom. Trage Deinen Suchbegriff ein und drücke Enter.